Poor road conditions in the Los Angeles area cost the average motorist about $3,000 a year due to higher vehicle costs, traffic crashes and congestion-related delays, according to a report released Wednesday by a national transportation group. According to TRIP’s report, 83 percent of roadways in the Los Angeles-Long Beach-Santa Ana urban area are in poor or mediocre condition, costing the average motorist an additional $892 each year in extra vehicle operating costs, including accelerated vehicle depreciation additional repair costs, and increased fuel consumption and tire wear. The survey — released at a news conference in downtown Los Angeles — also finds that traffic congestion in the Los Angeles area is worsening, causing 80 hours of delay per year for the average motorist and costing each driver $1,711 annually in lost time and wasted fuel. To make matters worse, 8 percent of bridges in the area are structurally deficient and 23 percent are functionally obsolete, according to the Washington, D.C.-based organization. The report found that throughout the state, 37 percent of major locally and state-maintained roads are in poor condition and one quarter of California’s bridges are structurally deficient or functionally obsolete. The state’s major urban roads are becoming increasingly congested, with drivers wasting significant amounts of time and fuel each year. And, more than 14,000 people were killed in crashes on California’s roadways from 2010 to 2014. 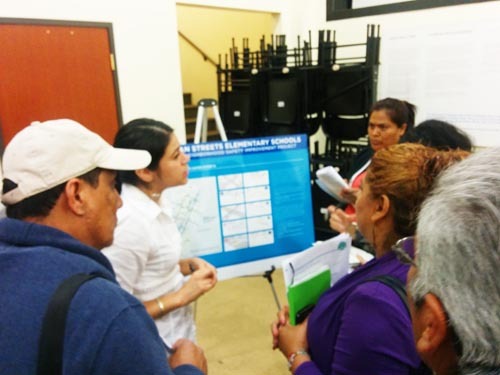 Walking or bicycling to school could get safer for eastside students under a street improvement plan outlined last week during an open house at Boyle Heights City Hall. Speed humps, curb extensions, high visibility crosswalks and roundabouts are some of the improvements planned near Breed Street and Sheridan Street Elementary schools as part of the Safe Routes to Schools initiative. The office of local Councilman Jose Huizar and the Los Angeles Dept. of Transportation (LADOT) hosted the public event, which included displays showing where and what types of changes are in the works for Breed and St. Louis Streets, from Sheridan Street to 6th Street, and along Soto Street from Wabash to 8th Street. The streets run parallel and are all within a one-quarter mile radius of the “High Injury Network (HIN)”, Los Angeles streets with the highest concentration of traffic collisions that result in injury or death with an emphasis on those involving pedestrians or cyclists. The Safe Routes to Schools program is an effort between the Los Angeles Unified School District and the city’s transportation department to make travel safer for students going to and from schools. Over 500 LA Unified schools were looked at and the top 50 schools in need of improvement — based on such factors as the number of students living within walking or cycling distance of the school, number of traffic collisions in the area and “burdened with the poorest health outcomes and economic conditions” – were identified. In Boyle Heights, Breed and Sheridan Elementary schools made the list. Huizar worked with the transportation department to secure $5 million in funding from the California Dept. of Transportation Active Transportation Program to pay for improvements, which, according to Boyle Heights resident Veronica Bañuelos, are long overdue. Bañuelos told EGP residents have been asking for safety improvements along St. Louis Street for years. “We live in a very dangerous area,” she said in Spanish, noting that she has witnessed multiple accidents on the street in the same week. There are no stop signs on St. Louis Street between Cesar E. Chavez Avenue and 4th Street and cars speed through the area without stopping for pedestrians, she said. “We requested a stop sign but we did not get a response from the councilman,” until now, she said, happy to see the changes coming to the area. Boyle Heights resident and Union de Vecinos (Union of Neighbors) member Maria Benitez said the community had grown frustrated by what she claims was Huizar’s lack of response and his failure to show up for scheduled meetings with the community group. Taking in the proposed changes, Estrada said he would like to see the speed limit lowered through the area and more stop signs on other residential streets. For some people, especially children and the disabled elderly, crossing some streets can be “suicidal,” Estrada said. The intersection at Cesar Chavez and Soto Street is one of the most dangerous zones in the area, according to the Federal Highway Administration. The HIN data show that collisions involving people walking or bicycling are 2.5 higher than the citywide average. There have been 44 collision-related injuries, including two fatalities involving pedestrians and bicyclists along Soto Street, between Wabash Avenue and 8th Street. L.A.’s transportation department estimates about 60% of Breed and Sheridan students walk to school daily. Margot R. Ocañas, pedestrian coordinator with LADOT, told EGP the goal of the program is to improve safety for people walking to school through enhanced street engineering, traffic enforcement and safety education. “This neighborhood has a high density of students who do walk and bicycle so it is very imperative that we address concerns about traffic safety and put in what we call safety measures,” she said. On Soto Street, for example, traffic signals will be installed at Boulder Street and 3rd Street. Bike “safety zones” will be added on Breed Street and on St. Louis. To slow traffic down, nine speed humps will be added on St. Louis Street and ten on Breed Street, between Sheridan Street and 6th Street. Huizar said in a statement that he’s proud to be partnering with transportation officials in this much-needed project. “Protecting our children is every parent’s biggest priority and these upgrades will help bring profound safety improvements to students and families in our community,” he said. Construction is tentatively scheduled to begin in January 2017 with completion set for late 2018. Street improvement projects in Eagle Rock and the Boyle Heights area were recently earmarked for almost $18 million in state and other funds, City Councilman Jose Huizar announced. The funds will go toward “complete street” initiatives “that prioritize pedestrians and bicyclists as much as automobiles, while also helping drive foot traffic to our main corridors,” Huizar said. Eagle Rock is getting about $12 million, including a $9.8 million grant from the California Transportation Commission for a number of upgrades along Colorado Boulevard: pedestrian lighting between College View Avenue and Eagle Vista Avenue; curb extensions at 21 sites, including Townsend, Argus and Maywood; a flashing crosswalk at Eagle Rock Boulevard and Merton Avenue; a new sidewalk next to College View Avenue; street furniture; and bicycle striping. A $2 million grant from the state’s Active Transportation Program was awarded to the Eagle Rock area, and will pay for medial islands on the westside of Eagle Rock Boulevard, a pair of new traffic signals at La Roda Avenue and Hermosa Avenue, and bus stop lighting. Boyle Heights is receiving $6 million, including $5 million in Active Transportation Program grants for sidewalk work, pedestrian lighting between Pico Gardens housing and Sixth Street Bridge East Park, and a new signal at Fourth and Clarence streets. Whittier Boulevard also will get $1 million in redevelopment funds for sidewalk repairs, though more funding is being identified. In addition to the funding announced today, Boyle Heights had already received $2.55 million last year to build new sidewalks and bicycle amenities along Mission Road, from the Sixth Street Bridge to Seventh Street, and a roundabout. These projects are set to begin construction early next year.